We're half-way through the week! 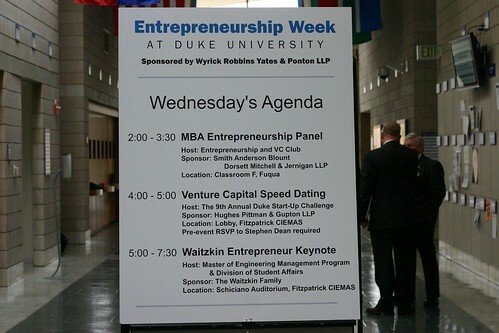 Wednesday was our biggest day yet, with 4 events: the High School Pitch Session, an MBA Entrepreneurship Panel, VC Speed Dating, and the Waitzkin Entrepreneurship Week Keynote Speaker, Ernest Mario, PhD. Early in the day, high school students from two local high schools, Riverside and Hillside, had the opportunity to pitch their business ideas. These high school students have been advised by Duke MBA students over the course of the semester, and these presentations were the capstone of their work. 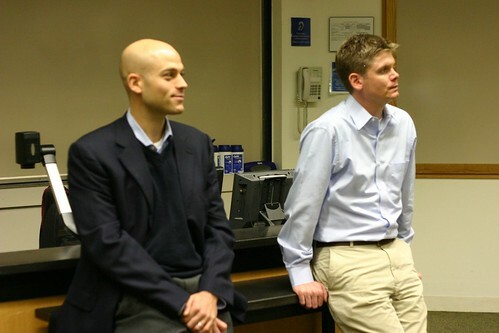 At 2:oo PM at Fuqua, the Entrepreneurship and Venture Capital Club hosted the MBA Entrepreneurship Panel featuring Jonathan Gindes, Fuqua Daytime '03, and Jed Carlson, Fuqua Daytime '05. Jonathan and Jed answered questions and gave advice to an audience of MBA students interested in pursuing entrepreneurial paths. The panel was sponsored by Smith Anderson Blount Dorsett Mitchell & Jernigan LLP. 10 teams of entrepreneurs, 10 VCs, 10 tables. One hour for students to mix it up, pitch their ideas, and get feedback. 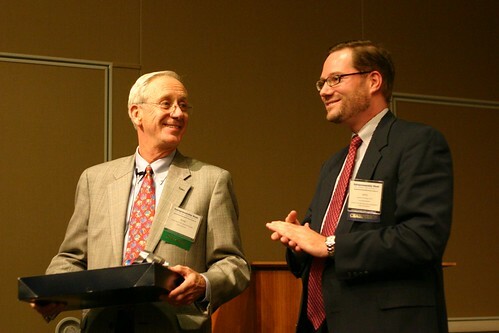 The event was hosted by the 9th Annual Duke Start-Up Challenge and sponsored by Hughes Pittman & Gupton LLP. The day ended with the Waitzkin Entrepreneurship Week Keynote Speaker, Dr. Ernest Mario. Dr. Mario has 40 years experience in the pharmaceutical industry, and has served as CEO of Glaxo, Alza Corporation, Apothogen, and Reliant Pharmaceuticals. In his presentation, Dr. Mario elaborated on the various leadership roles of his business career and explained to the audience that "...entrepreneurs cannot be afraid to fail." The event was hosted by the Master of Engineering Management Program at Pratt and the Division of Student Affairs. 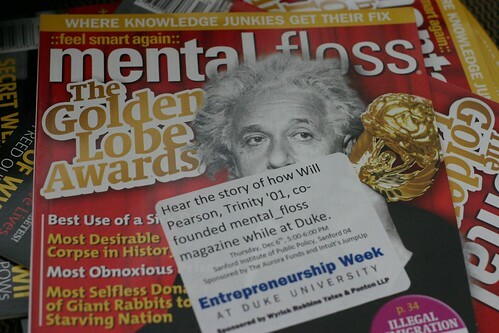 Tomorrow is the Duke Start-Up Job Fair, the Undergraduate Capstone Speaker ( Will Pearson, founder and president of Mental_Floss magazine), and the Undergraduate Entrepreneurs Pitch Session. See you at the events! Nice to see this informative. I visit the site more times for collect information. This post about MBA Entrepreneurship Panel. VC speed dating etc. I have read this post very carefully and collect more information about MBA. Thanks for this post. You share the details of MBA course very well. it will help many students to the idea of MBA degree. 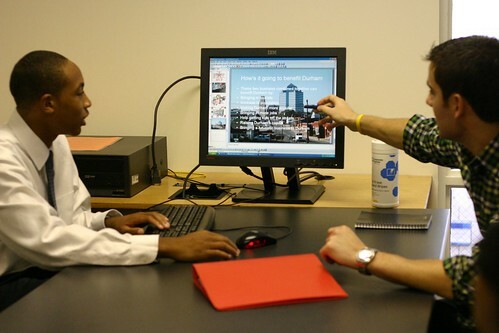 if you want to know more about MBA read here for more information. http://www.residencylor.com/emergency-medicine-letter-of-recommendation-sample/ just go in this site & will give you some handy tips and guide to write your term and others academic papers. It appears as though the purpose of the MBA is to get promoted or advanced by set up organizations.do my homework for money - MyAssignmentService.com What is the purpose of going to class to wind up a business person? That is to say, I understand that you get the hang of bookkeeping or showcasing abilities, however is that extremely justified regardless of the educational cost? The understudy credits are just going to be a delay you beginning an organization, isn't that so?